the collection really catches my eyes. Black on black seriously never fails. fierce, and whimsical at the same time, which somehow reminds me of the vampire-ish theme. 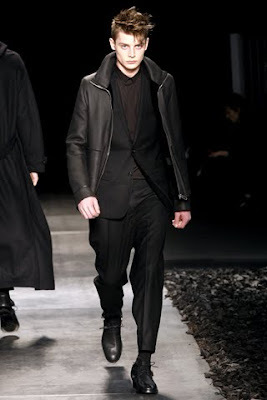 love the layering, ah-mazingg texture, and that black coat. We never can get enough of the military theme! 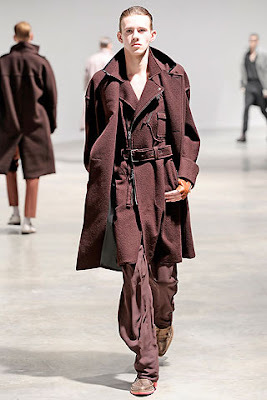 military colour of brown and army green fills the runway and seriously who can resist the details of that military style buttons and shoulder pad? Lanvin plays a little bit of colour, although it is still muted yet attractive, like navy and maroon. Keep the outfit baggy but get the belt on. Besides that, he headband details also can be found in this collection. 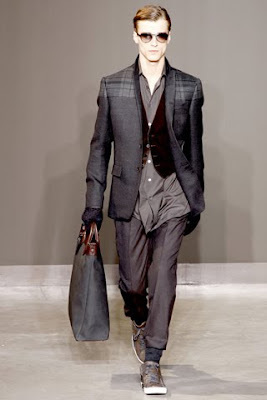 Kudos to Louis Vuitton for the hauteness of entire collection! Well fitted or straight leg trousers, coat or blazer in different colours, shirt and vest, name it honeyy, it's like all under one collection. Winter is not always associated with wool. Grab the leather jacket and you are ready to rock the winter bleak away. and yap! Trousers which is tucked inside the boots will complete the look. 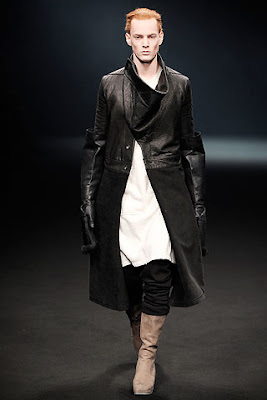 baggy outfit, runched shoes, and long coat are the key items of Rick Owens' collection. This give the laid back feeling but still looking stylish at the same time. Back to the old school days? Checkered pattern, geeky glasses, bow tie, and iconic vest give the collection a preepy look. It's up to you wether to pick neutral colours or a wee bit of colourful outfit. I love the military inspired jacket on burbery prosum collection. This is my favorite, indeed!! This post is amazing I love it so much!! Men’s wear inspires me so much! It’s like a guide to me no joke I love oversized sweaters and blazers I love blazers!!!! So so much they make a simple outfit brilliant! Am thrilled with this post I love it♥ thanks darling for the amazing comment! 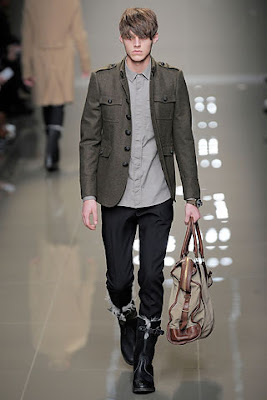 i never really look at menswear but there's really good stuff in here..
i always love burberry for men... classic! i always love burberry much! great post, i really need to get into mens fashion more! i saw you , you used scraf right ? i'm played Go-kart at Pantai Indah Kapuk..
i love your post!nice men's wear! Thanks for following me back dear! :) love this post!! btw, I am studying in Jubilee School, Jakarta. Do u know? I'm still in grade 12. :) how bout you? You can never go wrong with Ann D. For men or women. She is just amazing. Burberry is bringin' it! LOVE! all the jacket are very great! 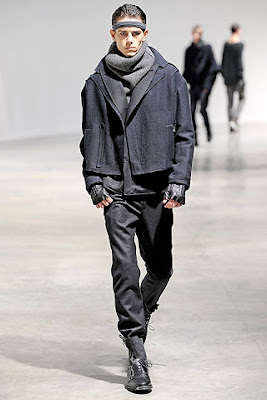 waa i like neil barrett. btw, are you in Sg rite now? really awesome post, the most influential men labels in one browse! and really liking the sleek look they have going on this season. classy. it's all sooo much fun! Fabulous selections, darling! 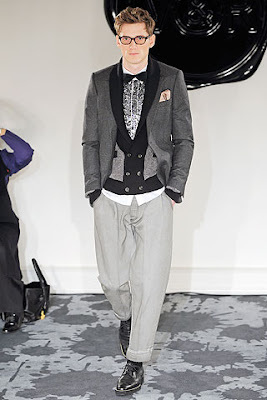 Love your first menswear post, especially the jackets at Burberry and Lanvin! 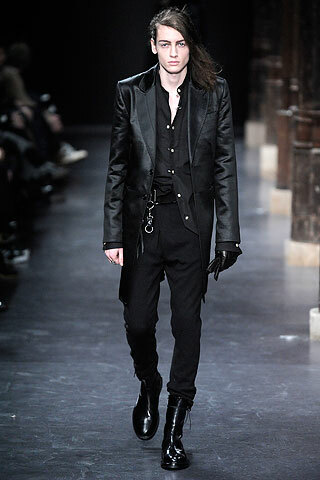 I think Ann Demeulemeester and Rick Owens can never do much wrong, but I love all the looks you chose here. The Burberry and V&R ones are very cool yet timeless as well. i love all of these collections, tis very great. Wow, I totally love your style! I really like that military-ish vest that you were wearing a couple of posts ago! Oh you chose some great selections, always love the cutting of Lanvin and Victor and Rolf are so quirky. Love them! 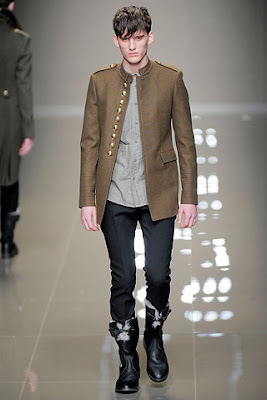 i love the military jacket from burbery prorsum..
hands down to burberry, neil barret, and viktor&rolf. 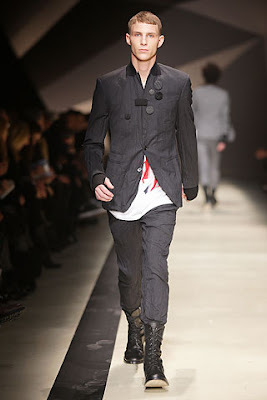 i enjoy browsing throught the menswear as much as i love the women collection! btw, surely we need to go for some food journey one day! can ask yiqin and valencia along. but i might not be free these weeks, so wait until i return from jakarta fhen <33 take care! i think my favorite is the v&r collection. i would def rock those jackets and pants too haha! its funny because i've been gravitating away from the dark...this post kind of got me interested in it again though..you're right about the black on black...it's a sure thing in a pinch! I wish we could find more guys like these roaming the streets..
Amazing post, dear! 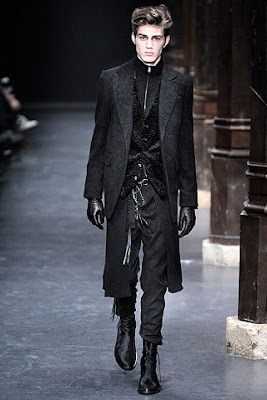 The first collection does have vampiric tones to them! I find them so fasinating!! And it's refreshing to see so many different types of style for menswear, who say women have all the fun? Tagged you in my latest post. Take a look? i think we can pull this off too right! 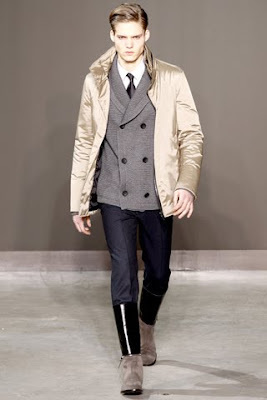 I love the military style by Burberry! 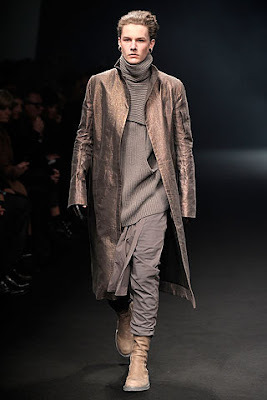 i always love looking at men's fashion - mainly cause i could never rock it. great photos! 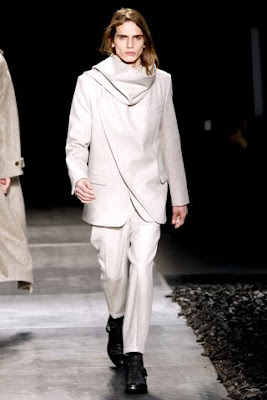 some of the menswear was much more impressive than this season's womenswear! and thanks for your sweet comments, it means the world to me! gosh! if i were a boy! i will drooling for those outfit awesome! If you want check out my blog and leave a comment! Thanks a lot! I enjoy reading your review!! 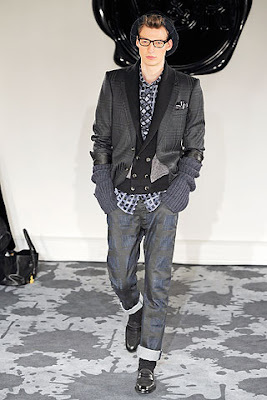 I love looking at menswear collections and imgine bf wearing some of the outfits :-P! P.S. My heels from New Look are a little uncomfortable at first but you just need to wear them a couple of times and then they feel pretty worn in and doesn't hurt to walk. I completely agree with you on the collections posted in the post. 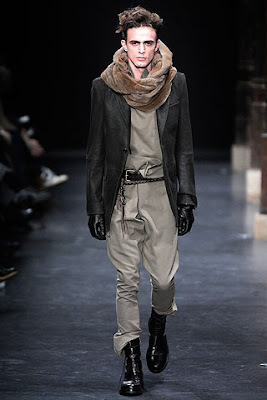 fall/winter 2010 is looking absolutely beautiful right now and i`m excited for it! you said it well, sweetie! i love all the collections. This is a good inspiration for me on dressing up Mr. Freddy. yay! always love ann... always rocks! !